Another year, another Disney film - despite unfavourable initial comparisons to Tangled, Disney's latest hit Frozen has managed to build a solid reputation since it was first advertised earlier this year and has recently opened across the world to enormous success. The Disney 2000s financial slump is now a long gone part of history, but can they still maintain their critical success with this latest release? The Kingdom of Arendelle has long been closed off from the world; an action which the eventual queen Elsa (Idina Menzel) governs to ensure the secrecy of her unusual powers, giving her the ability to conjure ice and snow in an uncontrollable manner. Her carefree and somewhat naive sister Anna (Kristen Bell) has long pursued a life outside of the castle walls, but her persistence begins to push Elsa over the edge, leading to a public reveal of her controversial magic, the freezing of Arendelle and Elsa's abandonment of the kingdom. In order to put things right, Anna must team up with mountain man Kristoff (Jonathan Groff) and sun-loving snowman Olaf (Josh Gad) to find her long lost sister and bring summer back to the frozen kingdom. We all know and love Disney for their mastery in the field of hand drawn animation, but their work in CGI in just as remarkable - Frozen is a gorgeously animated fare, with fluid and expressive characters and some of the best lighting seen in a recent Disney flick. While we're on the subject of aesthetics, Frozen also boasts an excellent soundtrack by Christophe Beck and conforms to Disney's classic musical conventions with an onslaught of charming songs - particularly Menzel's performance of Let It Go. It pains me to admit, however, that Jennifer Lee's script for Frozen is weakened by the film's sluggish pacing, which can make many scenes feel boring, some characters grossly underdeveloped and some concepts lacking sufficient focus. Outside of her tragic backstory, it's difficult to fully connect to Elsa, the misunderstood villain, whose role isn't as flourished and original as it has the potential to be. There's plenty to enjoy here; the characters are always fun even if underdeveloped, and the plot takes a unique turn which will leave many surprised - but it sometimes feels the excellent story doesn't get the execution it deserves. 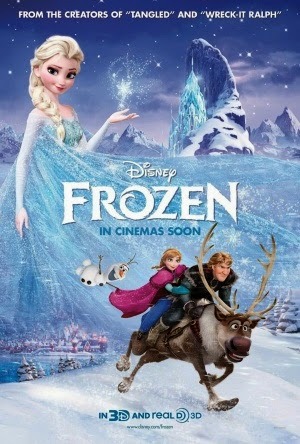 Frozen is a great film and has plenty of comedy, heart and lavish visuals for audiences of all ages. The initially controversial Olaf sidekick turns out to be loveable and hilarious, which should hopefully negate any criticisms, and the chemistry between Kristoff and Anna is charming if sometimes forced. Voice acting across the board is top notch - really my main criticism is with the pacing and balance the story sometimes lacks, but this won't stop the film being enjoyed by any fan of good ol' Disney movies.